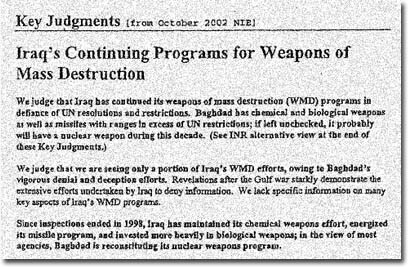 A summary of the October 2002 National Intelligence Estimate on "Iraq's Continuing Programs for Weapons of Mass Destruction" was released on July 18, 2003, ten days after President Bush allegedly authorized the vice president's chief of staff, I. Lewis "Scooter" Libby, to share similar information with New York Times reporter Judith Miller. and fourth, a Freedom of Information Act release to the National Security Archive on June 1, 2004, that included two additional pages but left the vast majority of the estimate whited out. The July 18, 2003, "key judgments" document was declassified and released by the Bush administration just ten days after President Bush authorized Vice President Cheney's chief of staff, I. Lewis "Scooter" Libby, to disclose similar information to Miller, according to Libby's testimony before a grand jury. "The ship of state is the only vessel that leaks from the top," commented Thomas Blanton, executive director of the National Security Archive. Also included in today's posting is the October 2002 unclassified presentation on "Iraq's Weapons of Mass Destruction Programs," with the seal of the Director of Central Intelligence on the cover, and a version of the NIE released by the CIA on June 1, 2004, in response to a Freedom of Information Act request by the National Security Archive. The document was almost completely redacted by CIA censors. All of the text except for the two title pages and the two pages listing National Intelligence Council members had previously been disclosed in the July 2003 release.